Scotch whisky distillery Glenfarclas has unveiled 60 complete sets of its Family Cask series that spans 1954 to 2003 for £100,000 each. Proclaimed as the “most expansive single collection” ever released by a distillery, the collection contains 50 200ml bottles, covering every single malt spirit in the Family Cask collection that has so far been released – and some may never be released again. Packaged in a custom-made trunk, modelled on old shipping luggage, the trunk also contains four tumblers, four nosing glasses and a water jug, four slate coasters and three books on the distillery’s history, tasting notes for each vintage and one for the buyer’s own notes. George Grant, sales director and sixth generation of the family to own Glenfarclas, said: “This is a once in a lifetime opportunity to buy a full collection of vintages in a complete set. It is the first – and last – chance to purchase this, as some of the vintages contained in the trunk are from the last casks of their respective years. 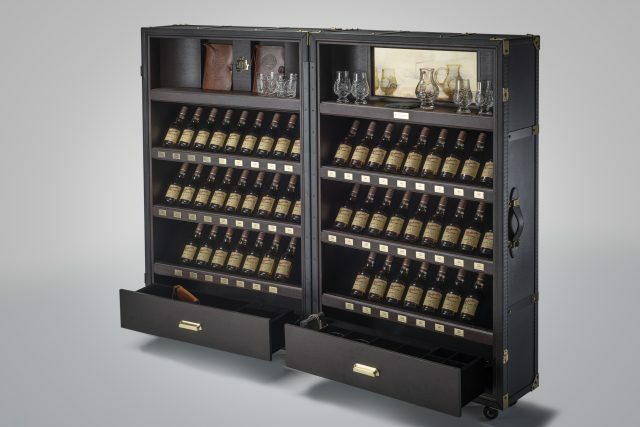 Just 60 trunks are available worldwide, with an RRP of £100,000.